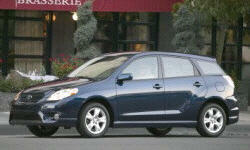 The Matrix is based on the Toyota Corolla platform and is one of the most reliable cars on the road. So the issues for those years are not terrible. According to Consumer Reports Exhaust rusting through, paint and trim issues (the sheetmetal has issues with salt), and of course the air bag recall are the major concerns. So if you can find one that does not have rust and you keep it clean by washing it a lot, it should give you fairly reliable transportation for years to come. A relative safe bet in the used car market. Note the 2005 model year has shown some transmission issues, but not as many cars have that problem. The ECM is the #1 problem/failure in the years you mentioned. Older Toyotas often burn oil, but usually don't have many consequences for a while.